The Board of Directors and staff of Food Secure Canada were gathered in Montreal this weekend, and we took this photograph to illustrate how Cathleen Kneen's vision and spirit continues to animate the food movement. She died in Ottawa surrounded by her loved ones, hours later. We grieve her passing and celebrate her life. Read her obituary here on facebook. 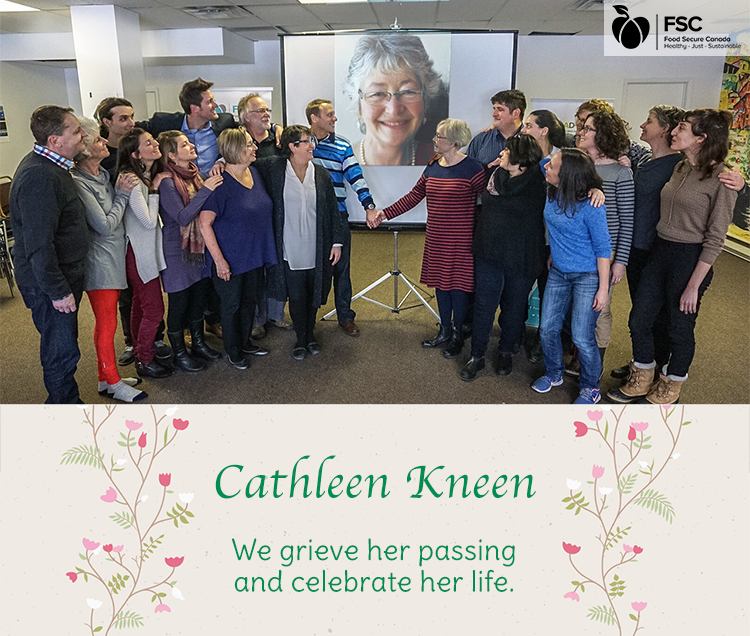 Cathleen was a long-standing social justice activist and feminist who has helped found groups from day-care centres to battered women’s shelters to food systems networks, including Food Secure Canada. In 1971 she and her husband Brewster started a commercial sheep farm in Nova Scotia where they spent 15 years learning the food system from the ground up and started an annual Sheep Fair, Northumberlamb lamb marketing co-op, and The Ram’s Horn, a newsletter of food system analysis. While in BC (1995-2006), Cathleen founded and was the first coordinator of the BC Food Systems Network; she was involved in a variety of local and regional food and agriculture initiatives including establishing two farmers markets and serving on the Board of the Certified Organic Associations of BC in several different capacities. As chair of Food Secure Canada, Cathleen worked tirelessly to advance the principles and practice of food sovereignty, including the People's Food Policy Project which produced Resetting the Table: A People's Food Policy for Canada. She is the former chair of Just Food in Ottawa, and having previously helped found the Toronto Food Policy Council, then chaired the Ottawa Food Policy Council. Cathleen and Brewster Kneen published for many years The Ram's Horn, an entertaining and informative newsletter about our food system. To read some of her writings, visit the Ram's Horm website. 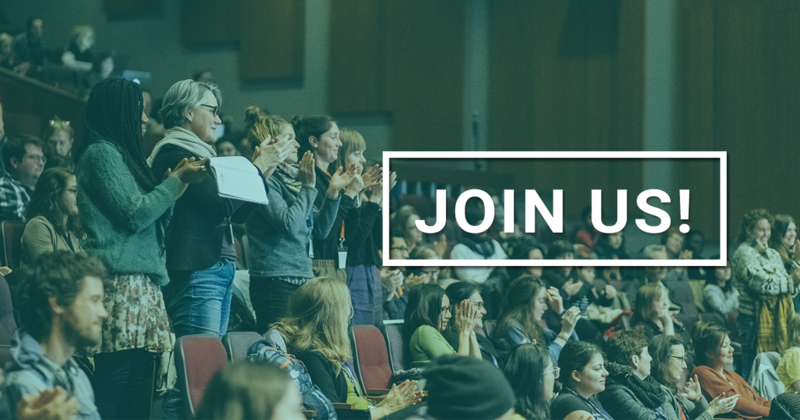 At our Assembly every two years, Food Secure Canada gives out the Cathleen Kneen Award to recognize vision, leadership and a commitment to grassroots activism in building a more just and ecological food system. Cathleen described this as the core work of building relationships based in community. As she pointed out, "if you want to understand a food system, listen to the people who are most oppressed by it, who see it from underneath and can see how it is constructed. Leadership from the ground up is key to long-lasting, effective work for a just and sustainable food system, as it connects people and reframes the elements of food systems to make something new, strong, human-scale, creative and resilient." Nominations for this year's award will open in May. 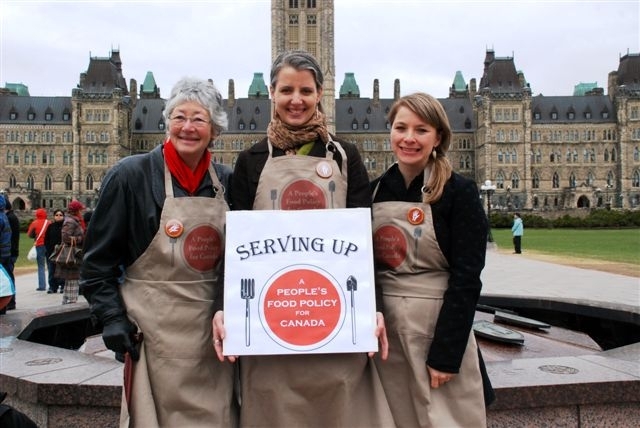 People's Food Policy launch on Parliament Hill, April 18, 2011. There will be a visitation on Friday, February 26, from 2-4pm, at the Ottawa Funeral Co-operative, 419 St. Laurent Blvd., bus route #7. There will be other celebrations all over the country throughout the spring as well. Permalink Submitted by Clark Stuart on Tue, 2016/02/23 - 7:56pm. Permalink Submitted by merlinjohn on Tue, 2017/04/11 - 9:20am. Usually I check the blog for latest updates and things related to your business firm and I am very much satisfied with this blog. This time I got this site post reminding Cathleen Kneen’s vision and I hope the blog members will keep their great work!